You are here: Home / Content / How to Strategically Create Content for Your Facebook Page. 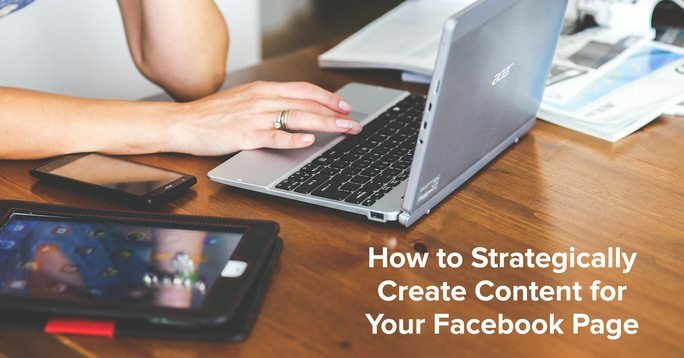 How to Strategically Create Content for Your Facebook Page. This is the fun part where you’re allowed to have a little freedom. Before you can retrieve the data of your content, you’ll have to have some content to analyze. This doesn’t mean to post whatever you want – it still has to be relevant. If you own a pet store, try posting about pet grooming tips or pet training tips with some sale posts mixed in. Once you have a solid amount of content and interaction, you can start seeing what works and what doesn’t. Now, look at the posts you’ve published on your page. Take notice of what is getting the most engagement, and create more content with the same concept of what performs well. Take all bias out of the equation. For example, let’s pretend you publish two posts on your page; one featuring a cute kitten and another showing a snake. You may personally love the picture of the cute kitten and hate the post with the snake. However, if your fans engage more with the snake content than the kitten content, it makes more sense to post pictures of snakes. This is a strategic decision because the snake resonates with your community and increases engagement. To do this, you’re going to have to go to your ‘Insight’ tab on your business Page. Once you’re in this section, there’s a tab labeled ‘People’. This page offers some basic demographics for the fans that currently like your Page. If used the right way, this can provide a wealth of information and help you to strategically create content. Let’s say 72% of your fans are women. After doing some reach you may notice statistically, women are more likely to buy accessories for their dogs than dog toys. If that were the case, it would be beneficial for you to make more sale posts based around dog leashes, sweaters, and so-on, rather than dog bones. Posting content aligning with a strategy of what your community enjoys rather than blindly creating content you like exponentially increases the chances that the content will generate more engagement. The steps above will help you create a business Page that your community will not only enjoy seeing, but will encourage them to pass your content along to their friends.